With the Holiday Season fast approaching we want to let our customer know that orders placed after certain dates cannot be guaranteed to be received before the holiday. Please reference the table below to make sure you don't miss out on your Holiday Order! **Note** all cut off days assume 5 business days in transit shipping from our warehouses/manufacturers. Shorter turn around times may be possible, call for availability. Also once an item has been shipped we cannot guarantee delivery times as the item is no longer under our direct control. **Note** Most mats (other then sports mats & custom made mats) ordered from Dec 23th - 27th will be shipped out on Dec 28th or 29th. Also note all Expedited orders (including UPS 2nd Day Air) must be placed over the phone we cannot guarantee expedited shipping/delivery through online orders. 1. What is the turn around time for my item to be shipped out? This largely depends on the item that you are ordering. For Holiday, Seasonal Funny mats & Boot Trays they typically ship in 1-2 business days largely depending on the order load in the warehouse, during the holiday season we typically get this down to same day or next day. Our Sports, Military, Camo & FoFlor Mats are typically shipped out after they are produced which takes 7-11 business days. Most of our other items including Rope Mats, At Home Anti-Fatigue & Coir Matstypically ship in 2-6 business days, with Business/Commercial mats shipping in 7-12 business days. *Please note that the above time frames are estimates. With the exception of the sports and military mats, the mats are typically shipped out closer to the middle of each ship window. If you need quicker turn around time please contact us and we will let you know what the shipping time frame is more exactly for the item/items your are interested in. 2. How long does it take to get my Mat once it has shipped? Once your mat has shipped it depends where you are in relation to the warehouse that the mats are coming from. The Chart below uses the Regional Division and is a rough estimation and is based on the Census Regions and Divisions which can be viewed here or seen below. 3. Are there shipping charges and how much are they? 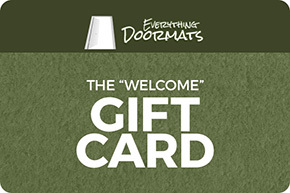 Here at Everything Doormats we try & make your shopping experience as easy as possible. Our owner strongly believes in showing our customers the true costs of their purchase. As such we do charge shipping instead of rolling portions of the shipping cost into our product's prices. To do this we use Table Rate Shipping that typically starts at just $9.99 for the first mat(may be more for bigger and more expensive mats). After the first mat it is typically $1.00 more per mat until you reach $150. Once you reach $150 the shipping is then Free! *Note: Both the additional dollar and Free Shipping are only valid on orders shipped from the same warehouse location to locations in the Contiguous US. Due to the weight of the Commercial, Industrial and Business Entry mats Free Shipping is not available. For these mats the shipping cost will be automatically calculated based on size and weight using UPS's shipping calculator. All shipping cost, whether table rate or actual rate are based on the weight of the item/items purchased. Heavier items may cost more then the starting $9.99 on the table rate to ship. Additionally multiple shipping charges may be assessed for orders with different types of items. See our Shipping and Retuns policies for further details.